According to ministry of foreign affairs, Qureshi expressed his serious concern on the incident. He also briefed his Iranian counterpart about the active efforts launched by the Pakistan law enforcement agencies to ascertain the whereabouts of the missing Iranian guards, in coordination with the Iranian military and intelligence counterparts. It was noted that the two Directors General (Military Operations) were in close contact through hotline to coordinate the search and rescue efforts including enhanced air surveillance and troops deployment in the border area where the incident took place. Shah Mehmood Qureshi said that such incidents are the handy work of our common enemies unhappy with the existing close, friendly relations between Pakistan and Iran. Reaffirming Pakistan's commitment of not allowing anyone succeed in such malicious efforts, Qureshi noted that Pakistan and Iran have traditionally shared a 'border of peace and friendship' which would be maintained in the same spirit. 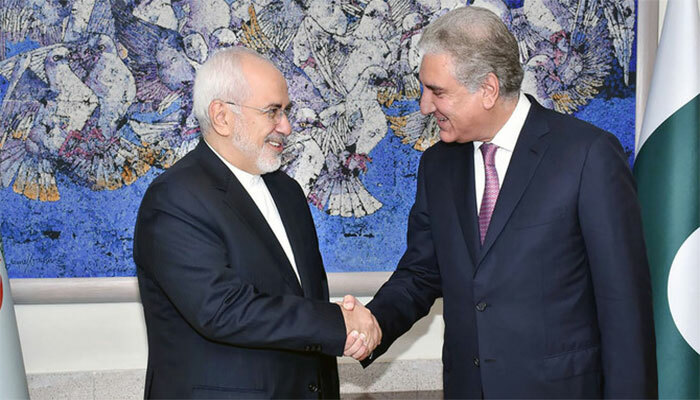 Javad Zarif thanked Qureshi and underscored Iran's desire to overcome all hurdles jointly with Pakistan in maintaining complete peace along the Pak-Iran border.